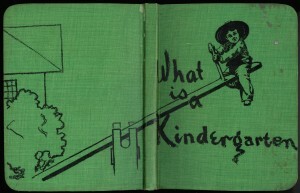 The kindergarten (literally “children’s garden”) movement began in 1837 when Friedrich Fröbel founded a play and activity institute in the Bavarian town of Bad Blankenburg. 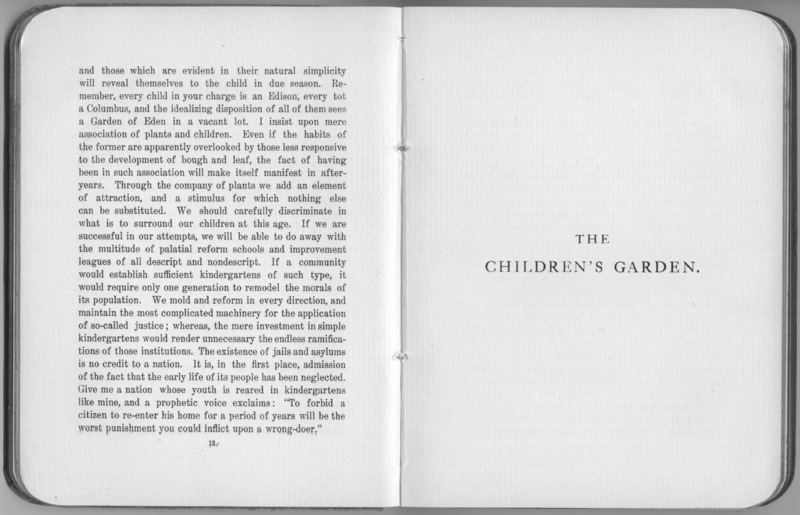 His idea was to create a social transition for children between home and school, and that they should be nourished like plants in a garden. 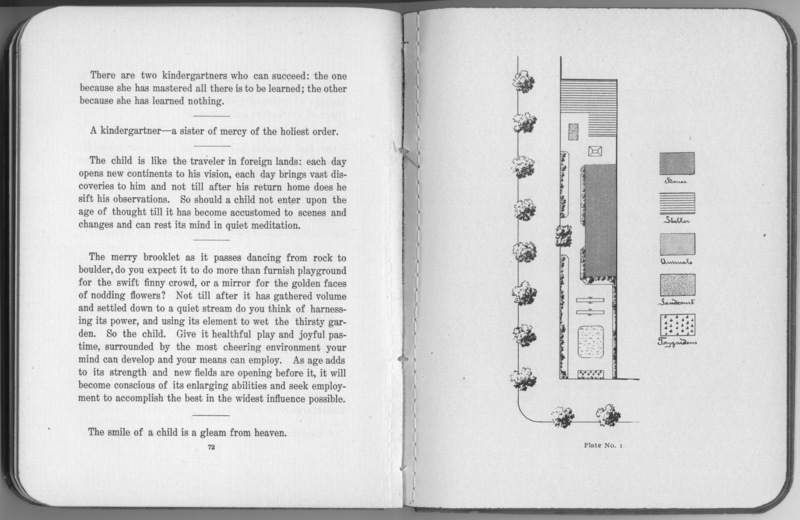 Fröbel’s ideas soon began to spread around Europe and then to America, where the first kindergarten opened in Boston in 1860 and the first public kindergarten in St Louis in 1873. We compare a man to an oak, a woman to a birch, a girl to a lily, a boy to a weed. This surely has foundation in reason. … Remember, every child in your charge is an Edison, every tot a Columbus, and the idealizing disposition of all of them sees a Garden of Eden in a vacant lot. I insist upon mere association of plants and children. 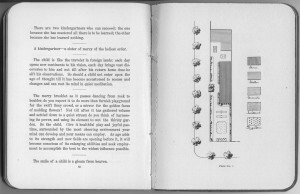 To bring home his point, Hansen included nine plates (see example below) of how to include garden areas on school grounds of different sizes and shapes. 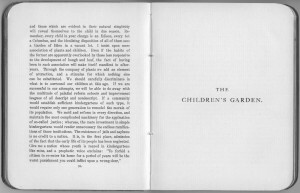 “If a glance at the series of plates gives the impression that every one of them might as well be the appointment of an area surrounding a private home as that of a kindergarten, their objects are served.” If Hansen were alive today, he would be joining Chez Panisse’s Alice Waters in evangelizing the Edible Schoolyard Project. 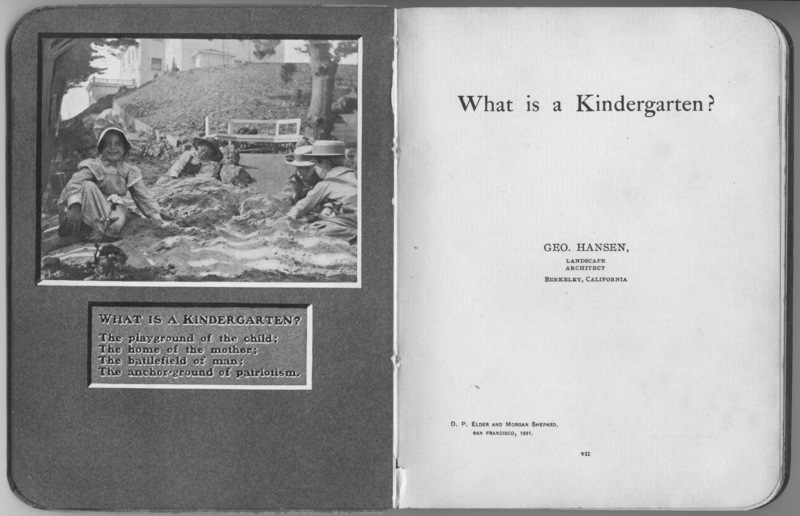 George Hansen (1863-1908) was born in Hildesheim, Germany. His grandfather, Rev. J. G. K. Oberdieck was a famous pomologist (the study of fruit) and was rewarded by the Prussian government with a guaranteed spot at the university for whichever of his grandchildren took a delight in horticulture. George was selected and attended the Royal College of Pomology in Potsdam. In 1885 he moved to England and worked for F. Sander & Company in their orchid house, and was elected a Fellow of the Royal Horticultural Society. Hansen came to America in 1887 and became foreman of the University of California Foothill Experiment Station in Jackson (Amador County). He became a distributor of exsiccatae, or specimens, of the Sierra Nevada flora, and wrote a book about it called Where the Big Trees Grow (1894). It was also in this year that Hansen completed his magnum opus, for which he is still best known, The Orchid Hybrids. In 1896 Hansen suffered a spinal injury which made walking extremely painful. He moved to the Scenic Tract in Berkeley, on the north side of the University of California campus, and for the next twelve years scarcely left the confines of his house and garden. 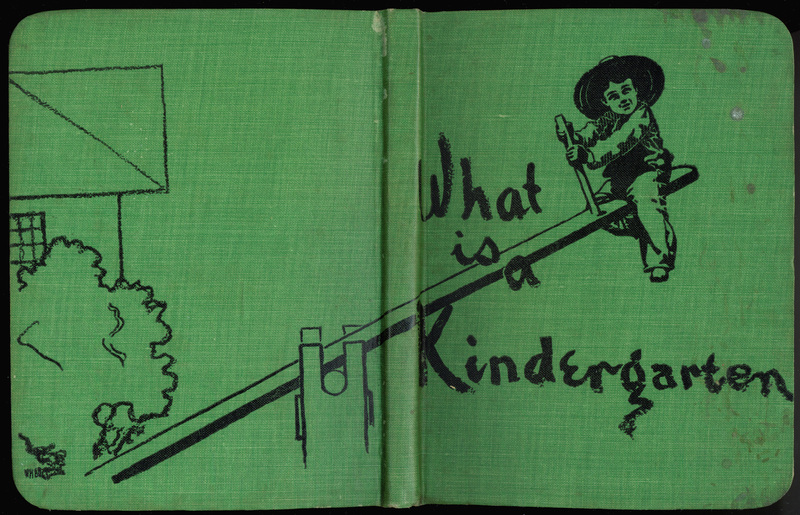 But during those twelve years he published What Is a Kindergarten? and continued to sell his botanical books and specimens. 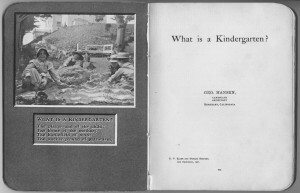 In 1902 Elder & Shepard also published five keepsakes called the Baby Roland Booklets, a photographic essay of his young son Roland. George Hansen died at his home in Berkeley on 1 March 1908, from complications of his spinal injury. He was only 45 years old.